A variety of products made from alpaca fiber are sold in our Heavenly Soft Fibers farm store. Some items are imported from Peru and several are made by local crafters using yarn from the alpacas living here on the farm. 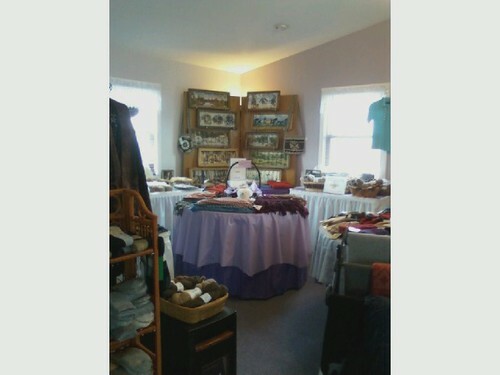 The stock includes hats, scarves, gloves/mittens, sweaters, vests, shawls and throws. The most popular item in the store is socks. We have several varieties including hiking socks, dress and sport socks for adults and children's socks as well. A large portion of our inventory consists of products made in the USA by the New England Alpaca Fiber Pool in Fall River, MA. We send a significant amount of fleece to them for processing each year. Raw fleece, rovings and yarn from the animals that live here at Heavenly Sunset Farm are also available in numerous natural colors. Customers can check out these items and then look out the window to see the animals from which the fleece was sheared. The store is open any time by appointment (607) 458-5499 or (607) 765-0306. Items made from alpaca fiber are unique and lasting gifts. Please give us a call to schedule a time that is convenient for you.